Buggy Simulator is a free simulator for Windows 8 and 8.1 where you get to drive a buggy. (The game’s name doesn’t mean that it’s full of bugs, lol!) When you run the game, you can simply tap on the main screen to get into the gameplay. 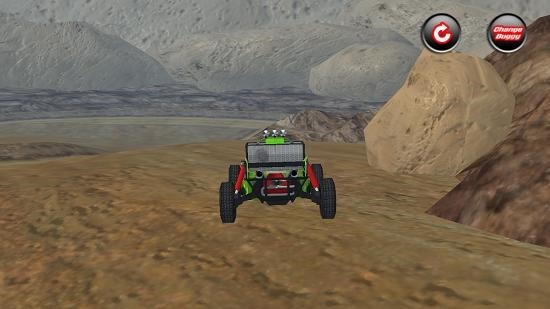 The gameplay is set in an environment where you can drive a buggy in a rocky desert terrain. The buggies are well designed and look realistic. You can control them with either the standard WASD controls or the arrow buttons. The game also allows you to change your buggy or restart if you get stuck or crash from controls at the top right. 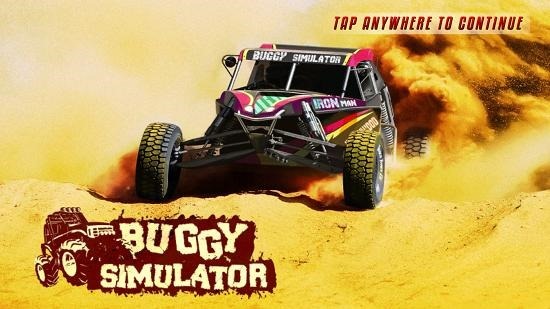 Buggy Simulator is freely available from the Windows App Store. The below screen is shown when you install and fire up Buggy Simulator on your device. The main screen is well designed as is very well evident from the screenshot above, and all it takes is a single tap on the main screen to get into the gameplay interface. The gameplay is visible in the screenshot below. 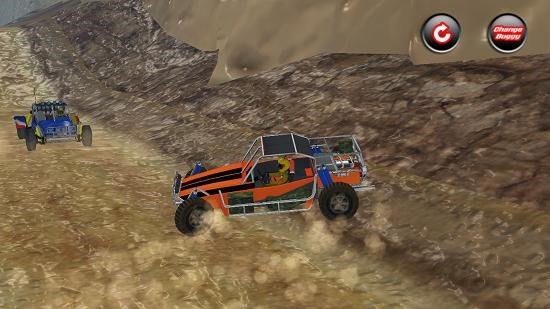 You can see that I am comfortably driving the orange buggy in the screenshot above. The game does a great job of mimicking a real rocky terrain where you can have tons of fun driving your buggy around, in fact so much so that you will be aimlessly driving your buggy around on this terrain for hours in order to explore it. The buggy can be controlled via the controls which are listed above and it can be changed via the Change Buggy button at the top right corner of the screen. As is seen above, my orange buggy has been changed to a green one in the above screenshot upon clicking on the Change Buggy button. If you crash or your buggy topples, you can click on the rounded arrow button at the top right to get a fresh new buggy. This concludes the main features of Buggy Simulator for Windows 8 and 8.1. The app is free and you should definitely check it out. You can grab the app for your Windows 8/8.1 device from the link below.